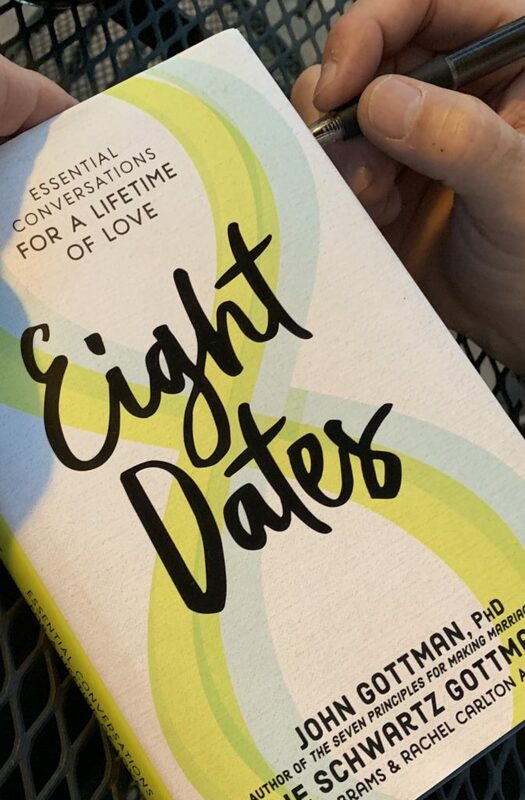 Eight Dates: Essential Conversations for a Lifetime of Love, the newest book by Drs. John and Julie Gottman, guides readers to have important conversations while on a date. 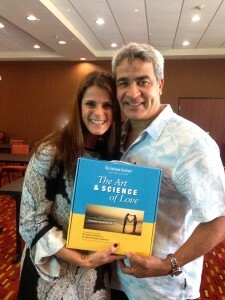 For Date #4 the topic is work and money and how each partner brings value to the relationship. It also includes a discussion of money histories as well as what it means to have enough money. The suggested location is something that costs as little as possible and reminds you of something you did as a couple when you had less money. Go to a fancy hotel and sit in the lobby or get take-out from your favorite restaurant and serve it on china. Pamper yourself. In the past we would have been on the patio of a Mexican restaurant, drinking Happy Hour margaritas and eating baskets of free chips. Our waistlines were more cooperative back then. So, with clear blue skies and a perfect 74 degrees, we still chose to be on a patio, but this time it was in our own backyard. Freshly potted planters and the scent of our blossoming lemon tree added something special to the gorgeous spring day. I nixed the idea of using china for our take-out from Thai Lao. To me, pampering means NOT washing dishes. As per the directions, we started the date by sharing three things we appreciate about each other’s paid or unpaid contribution to the wealth of the relationship. Being four months shy of 25 years together, we have no shortage of examples, but we each chose to focus on the present. His drive to have record-breaking overtime was celebrated, as was my ability to plan amazing vacations with said overtime. I call that teamwork. We then discussed answers from two questionnaires in the chapter, My Family History with Money and What Money Means to Me. Twenty-five years together and we still had untold stories regarding family histories. As we shared our stories, it was clear that both of our families gave us valuable, albeit sometimes painful, lessons with money without even realizing they were doing so. The Family History questionnaire made me wonder how our son will answer these questions in 25 years. Without even realizing it I am sure we are passing on both positive and negative messages to him. Thoughts like this help me to be forgiving of my parent’s flaws. My husband and I always knew we had similar philosophies regarding money since it is one topic we rarely argued about. But it was surprising to see exactly how in sync we truly are when we compared answers on the What Money Means to Me questionnaire. With the exception of our views on how money relates to stress and responsibility, we answered nearly identically. I guess that’s why it has always been easy for us to talk about money, which we do quite often. The Open-Ended Questions for this date were nothing new for us, but still fun to answer. We often love map about our fears and goals related to money. The final open-ended question of the exercise is “What are your hopes and dreams about money?”. This is the topic we have talked about most consistently for the last 25 years. My husband has had a recurring dream that he won $18,000,000 with a lottery ticket. We have fantasized and drooled about how we will spend that bounty, never giving up hope that someday we will match all of the numbers. But even if we never see a nickel of that $18,000,000, we have shared a lifetime of richness in those conversations. With bellies miserably full of Thai Beef and Noodles, he washed and I dried. Alexa was playing Thinking Out Loud by Ed Sheeran in the background. “We’ll start our low carb diet tomorrow. This time for real” I said with conviction to my husband, Sean. He’s heard it before. But he knows my weaknesses after 25 years together, noodles being at the top of the list. I overeat and then complain. Instead of judging me, he grabs a bottle of wine and some dark chocolate (more weaknesses . . . this man really knows me) and sits down at the table to continue our quiet, stay-at-home Valentine’s Day celebration. “So, who wants to go first?” he asks. 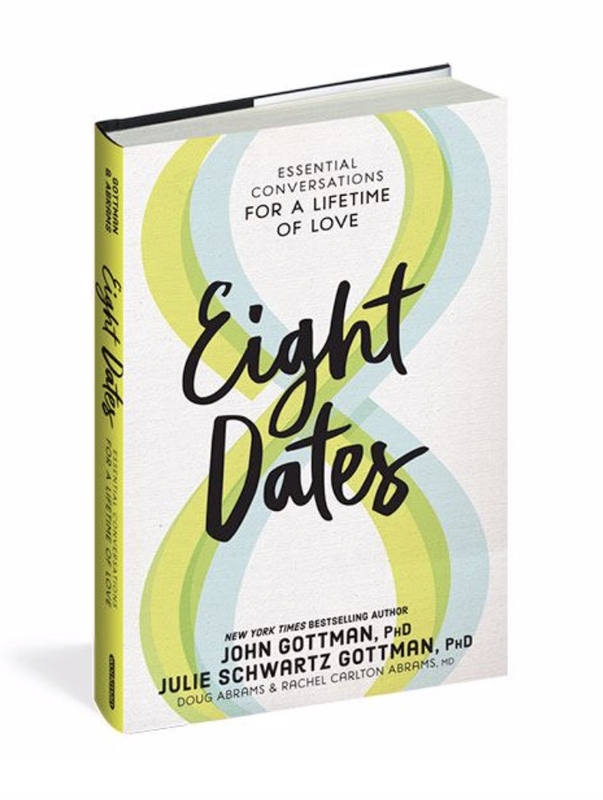 Earlier in the day I told him I wanted to have the First Date from John and Julie Gottman’s new book, Eight Dates: Essential Conversations for a Lifetime of Love. “I do!” I said, not giving him a chance to respond. Date “1” is Lean on Me: Trust and Commitment. After reading that chapter earlier in the day, I had compiled a list of things I cherish about Sean. While there were many things on my list, there were ten that stood out. I envisioned sharing in David Letterman Top 10 List fashion. When we cherish our partner, we have a deep feeling that they are irreplaceable. We simply cannot imagine our lives without them, even when times are rough. We find ways to tell them that we appreciate them, and do that often. Cherishing and commitment go together, but they are different. 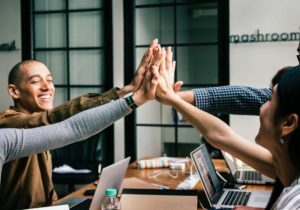 Commitment is really a verb because it is the actions we take daily to let our partner know we are with them, that we make decisions with them in mind. When we choose commitment, we resist temptation to betray our partner. We create trust and safety by turning towards them to work out our differences. Gratitude is nurtured by knowing what we have rather than focusing on what we don’t have. There is no gossiping or trashing of our partner to others. Sean and I have had our share of difficult times, that’s for sure. When our son was a colicky infant we leaned on each other for support despite being sleep deprived and cranky with one another. When my mother and beloved dog both died in the same year, I had a hard time shaking off my depression. 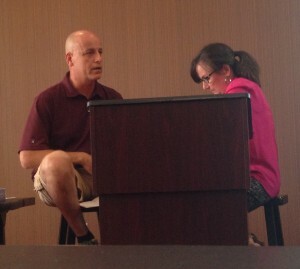 We argued more than ever and found ourselves in couples counseling. Despite these and other challenges, we never gave up on one another. The incident that sealed the deal for me though was when I had a health crisis 12 years ago. My mysterious illness had the medical community stumped and I was terrified. Our lives were turned upside down for months on end with scary symptoms and no treatment. My life and my outlook were forever changed. 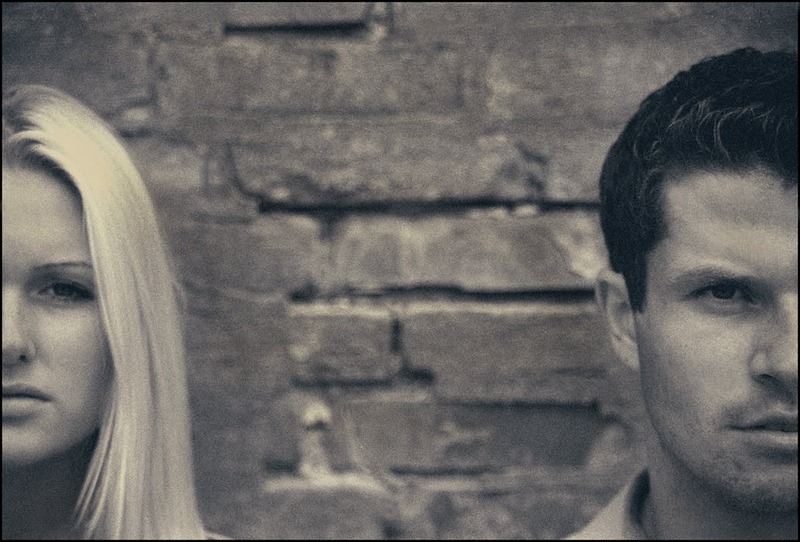 It wasn’t until I got a diagnosis and learned to manage my chronic symptoms that I could reflect on how it changed us as a couple. 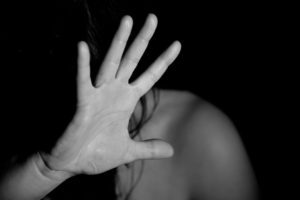 I had been too absorbed in my own fear to recognize how my husband was scared too. His life was also forever changed. But instead of complaining he expressed cherishing and commitment by supporting me through my illness in ways that I took for granted at the time. He rubbed my back when I was scared. He drove me to the Emergency Room in the middle of the night on countless occasions. When I had to change my diet, he joined me. He developed a patience with me that had not been there before. He was less quick to anger over small stuff and he started leaving love notes for me. While he never came out and said it, almost losing me made him realize how much I meant to him. I felt loved and cared for. We now joke that my near-death experience is the secret to our long marriage. As I compiled my Top10 List I realized I was describing our everyday life. Playing and laughing together, and that we get each other’s sense of humor. Raising a child and dogs together, a connection that is precious to us but was often fraught with stress, cleaning up bodily functions and money we could have spent in far more fun ways. Being comfortable to be myself with Sean and having my faults and bad habits accepted. And that includes bingeing on noodles knowing full well I will complain about it afterwards. The song was still playing as I started reading my list. Yes, I believe we have found love right where we are. And I could hardly wait to tell him.